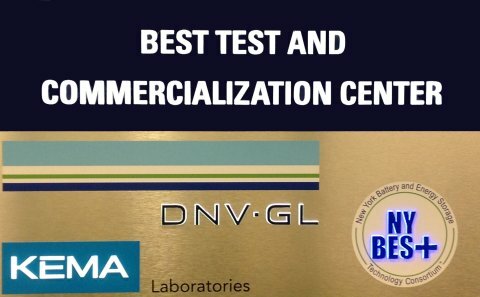 The New York Battery and Energy Storage Technology Consortium (NY-BEST) and its operating partner, DNV GL, officially opened the doors to its new $23 million world-class Battery and Energy Storage (BEST) Test and Commercialization Center. Over 100 representatives of companies in the battery and energy storage space were joined by New York State Lt. Gov. Robert Duffy and other dignitaries in seeing first-hand the Center's state-of-the-art facility in Building 308 at Eastman Business Park, causing one admiring spectator to bemuse in a positive way: “Well there goes the neighborhood!" The new Center includes testing equipment for battery testing of secondary cells and battery packs, as well as testing chambers of all sizes, for single cells to huge megawatt systems. Services including product development, performance validation and certification testing, and a wide range of environmental testing and battery lifetime testing are designed to accelerate the adoption and growth of energy storage technologies. “NY-BEST chose Eastman Business Park to establish this Center because of the Park's multiple resources, including deep and strong expertise in coatings and roll-to-roll manufacturing, extensive and scaleable infrastructure and equipment, and a captive high voltage micro-grid to facilitate large-scale system testing," stated Michael Alt, director of Eastman Business Park. 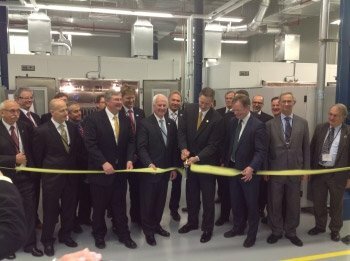 “The new testing facility will spur innovation in the development of critical next generation energy storage technology, improve the reliability and resiliency of New York's electric grid, and create good-paying jobs in the Rochester area, making EBP a world-class hub for clean, alternative energy."